Mar. 25, 2018 8:45 a.m. Dozens of Indigenous youth and other demonstrators gathered at Kinder Morgan’s Burnaby Terminal on Saturday, in the latest in a string of protests this past week against the expansion of the Trans Mountain pipeline. Protect the Inlet spokeswoman Virginia Cleaveland said 57 protesters had been arrested by early Saturday evening, bringing the week’s total to 172 arrests. Ocean Hyland, who’s also from the Tsleil-Waututh First Nation, said youth in the community have learned about the value of the land and water from their elders. “They teach us the ways to take care of the land and carry on the traditions of our people,” she said. Musicians Sarah Harmer and Grimes joined the march toward the Burnaby Terminal in support of the protesters. Protesters are prohibited by a court injunction from entering within five metres of two Kinder Morgan terminals in Burnaby. 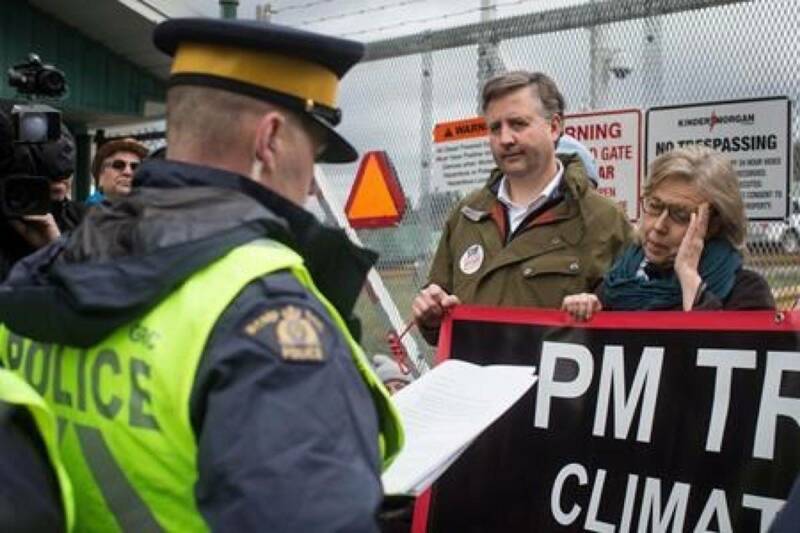 Green Party Leader Elizabeth May and local New Democrat MP Kennedy Stewart were among those arrested on Friday. The Trans Mountain pipeline expansion would triple the flow of oil products from Alberta to the B.C. coast. The federal government approved the project in 2016, but it continues to face significant opposition in B.C.